'Tis the season for warming bowls of oats! There is something about having a warm bowl of oatmeal that is so comforting. It is a perfect fit for this time of year. Anyone who knows me can attest to my love for oatmeal. I’m a huge fan! My love for this hearty breakfast cereal is not dependent on the weather. Hot or cold outside, my love for this creamy, comfort food remains. Today, I’m sharing with you my stovetop recipe for simple protein oatmeal. However, this is far less of a recipe and more of a “how-to”. The oatmeal base is relatively quick and simple to make, and you can really just add any extra toppings that you’d like. 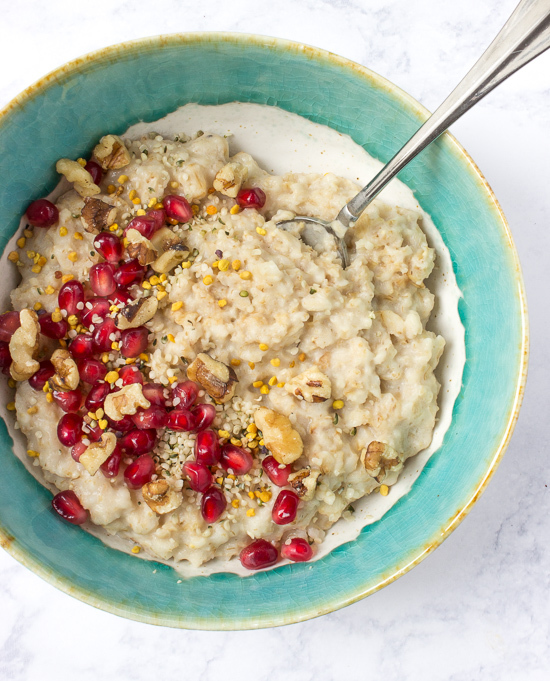 This version is topped with hemp hearts, pomegranate arils, walnuts and bee pollen. Aka: nutrient-dense powerhouse! For this recipe I used the Sunwarrior Classic Plus. This is one of their many protein powders that are free of GMO’s, dairy, gluten, chemicals, acids, solvents or anything artificial. The Sunwarrior Classic Plus builds off of the original rice protein with the addition of the amino acid balancing effects of peas, amaranths, quinoa and chia seeds. I love that this is still rice-based so it is gentle on digestion but really packs a nutritious plus with the other grains. I chose to accept this offer from Sunwarrioris not only for their exceptional product, but also their mission behind their company! “Sunwarrior is a small, growing health food company that's committed to making only the best plant-based foods and supplements while elevating humanity and preserving the planet. Our mission is clear—Illuminate Body, Mind, and Planet—and we strive to live those ideals in everything we do, from growing microgreens in our office to sourcing the finest ingredients from around the world when developing a new product. We believe that plants provide the cleanest and most powerful foods, rich in antioxidants, vitamins, minerals, enzymes, and phytonutrients we're just beginning to understand. Our bodies crave real food—especially in this age where we heavily process everything we eat, stripping out all the benefits and nutrition well before we have a chance to use them. I love that Sunwarriortruly believes that plants provide the cleanest most powerful source of fuel and references the mind, body and world! It’s right in line with the Nourished by Nutrition philosophy! A simple stove top oatmeal that is creamy and packed with protein. In a medium pot, place the rolled oats, water, ¼ and salt. Bring the oats to a boil and let them cook over medium-low heat for 3 minutes. While the oats are cooking, place the cashew milk in a small saucepan over medium-low heat. Add the protein powder and whisk it continuously until it’s dissolved. Continue to stir occasionally while the milk is warming. (Just warm the milk, don’t let it start to boil). Once the oatmeal is cooked, stir the milk into the oats and cook for another 2 minutes. Place the oatmeal into serving bowls and top with hemp hearts, pomegranate arils, walnuts and bee pollen or any other toppings you like.